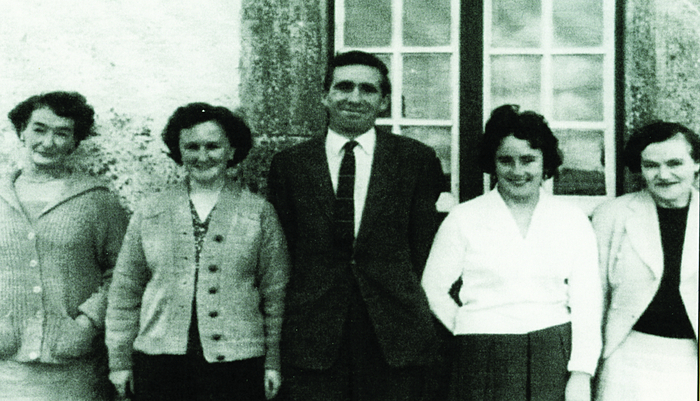 Teaching young children is always a challenge; but many people in Killimor have good memories of their school days: Here are the teaching staff in the national school: Margaret M Flood, Angela Geoghegan (editor of the book), Seán Fahy, Hilda Deeley and Mary B Duffy. To the green field by the sea. ‘Each girl had her own sewing box which contained pieces of material, thread, needles and a thimble. We were expected to have a pair of knitting needles, four sock needles and some wool. Mrs Flood taught us the basic stitches, tacking, hemming, top-sewing and back-stitching as well as plain and purl knitting stitches. We knitted a small sample sock and learned how to ‘turn’ the heel, and ‘graft’ the toe. I am taking the above reminiscences from an outstanding local history of the east Galway town of Killimor,* compiled by gathering family memories, documents and letters, church registers, newspapers, emigration records, maps and photographs, and the energy and support of the county council’s heritage officer Marie Mannion. It is attractively, and entertainingly, edited by former school teacher Angela Geoghegan, assisted by Nuala McGann. The reader gets a full picture of the town from earliest times, through to the present day. In fact when I finished the book I felt that I knew Killimor, its people and its story intimately. It was also a work of constant discovery, that brought the researchers to American University libraries. They were forensic in tracking down various people who had emigrated from Killimor. Augustine E Costello, born in the town in 1874, and educated at the local hedge school,** left for America and disappeared from the town’s records. Yet he emerged in New York as a rebel, and actor, a judge and an author. A copy of his History of the New York Firemen, was presented to Killimor’s heritage centre, following the success of their search. But not everyone achieved notoriety or fame. The real strength of the book is that it is the story of ordinary lives, many of whom savoured and enjoyed their youth in rural county Galway, and tells their stories with relish. In the boys school there was the addition burden of being selected to serve at Mass. At first the chosen ones were delighted as it was regarded as the ‘great escape’ from the classroom; but the training was arduous and in Latin! The priest made a valiant effort to ‘instill a sense of the sacred’ into the boys. It had to be a difficult task ensuring that they joined their hands properly, genuflected reverently, rang the bell at the correct time, lit the candles with the taper, held the paten under each recipient’s chin during the distributing of Holy Communion, and dressed appropriately for Mass in their white surplice and black soutane. ‘I still remember standing with my father outside Brody’s shop watching a tractor and trailer coming down the street, probably Peter Duffy’s, and my father’s remark: “ There is the end of trade. There’ll be no more of us. You had better keep on with your schooling”. He was right. Within a few years tractors were common fixtures, horses were headed for the glue factories, and I was headed for more schooling”. When I went fishing with bare-legged Joe. NOTES:* Killimor - Our parish and our People, published by Killimor and District Development Society, on sale only through [email protected], or telephone: 090 - 9676565. Hardback €35, paperback €25. ** In the 19th century and into the 20th century there were three hedge schools in the Killimor district. One was in Cnoc Mor and another in a place called Machaire. These schools were held in barns without roofs or in the open in sheltered fields. The names of the teachers were Thomas Dealy, Thomas Conningham and Mark Soughley. When the weather was very severe school was held in farmer’s homes. The subjects taught were English reading, writing and arithmetic. Irish was not spoken or used by the teachers.